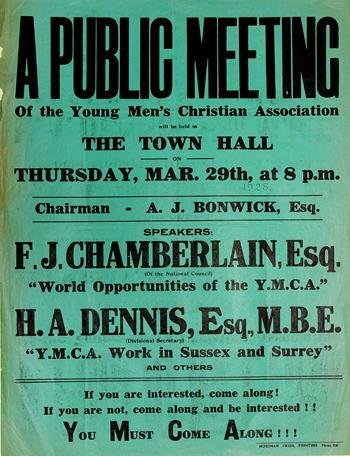 A public meeting of the Young Men’s Christian Association will be held in the Town Hall on Thursday, Mar 29th  at 8 pm. Chairman A J Bonwick Esq. Speakers F J Chamberlain Esq. (of the National Council) “World Opportunities of the YMCA”, H A Dennis Esq., MBE (Divisional Secretary) “YMCA Work in Sussex and Surrey” and others. If you are interested, come along! If you are not come along and be interested! !